Dimensions: 10.25" x 22.25" x 17.5"
If you want those fashionable boots of yours to look their best, don't throw them in your college closet in a pile with all your other shoes! The legging upper half of boots are prone to get dirty and creased if they're kept under a pile of other shoes. 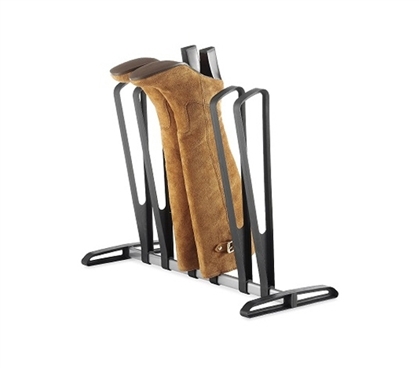 While hopefully you can keep all your shoes organized, this Boot Organizer - Holds Up to 3 Pairs, is just what's needed for those boots! Keeping your dorm room organized starts with keeping your clothes and stuff for college clean and off the floors. Not only will this boot hanger prevent you from tripping over your boots, you'll also keep those boots better maintained and longer-lasting if they're stored properly. You know those boots you own are fashionable, so why not leave them out for all to see and admire? Your boots will become part of your dorm decor with this organizer. (Yes, friends will be making compliments!) They'll also notice how clean your dorm room is without all those boots and other dorm supplies on the ground. As this boot organizer requires no tools to put together, you can have it ready in minutes and give those ever-fashionable boots their own practical hanger.